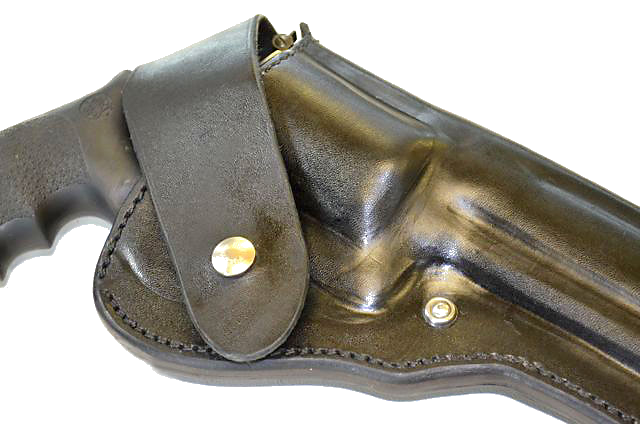 If you need a heavy-duty field holster for your backup when you're out hunting dangerous game, we've got just the holster. This was originally designed for a client who wanted to carry an X-Frame S&W on a trip to hunt Polar Bears. He gave it rave reviews. I use one for my 6" S&W 617, just in case I run across any vicious rabbits when I'm out for a walk in the woods. 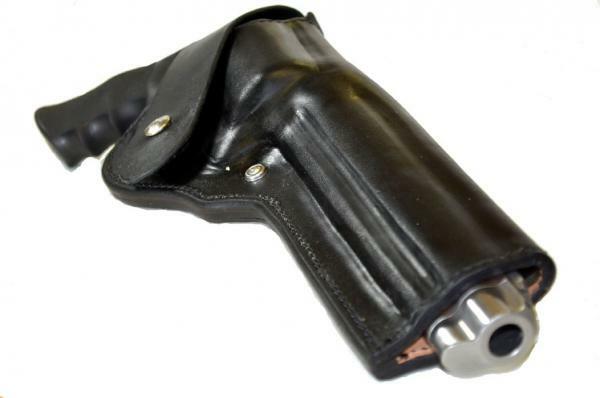 Crossdraw holsters have some inherent disadvantages, but there are times when only a crossdraw will do -- like when you're carrying a pistol so big that you can't clear the barrel if you draw it from the holster on your strong side. That's when you need our Hunter's Crossdraw. 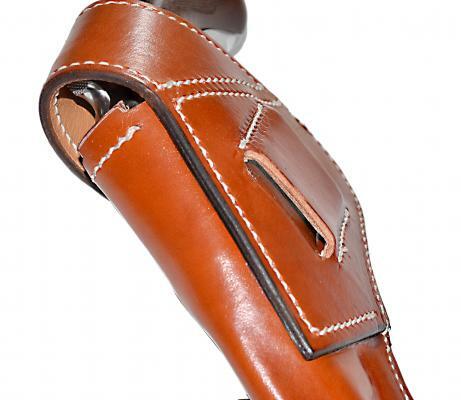 Made of eight-ounce, drum-dyed Hermann Oak cowhide, with a four-ounce veg-tan lining. The exterior of the holster is sealed with two coats of acrylic sealer. 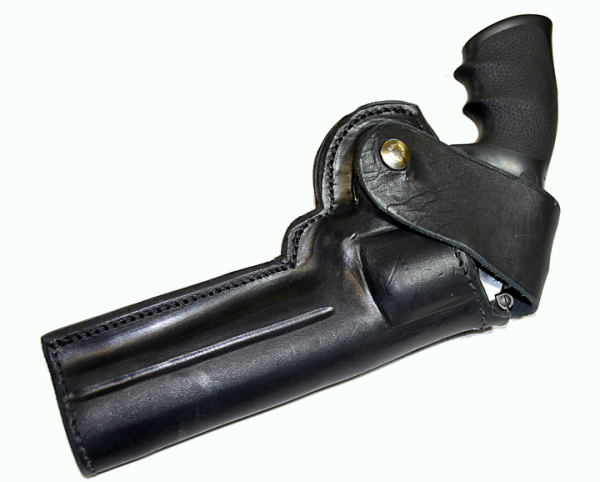 This holster can also be made for strong-side use, for revolvers with shorter barrels. -- a heavy-duty, stitched welt. -- a stitched-in, glove-leather lining. 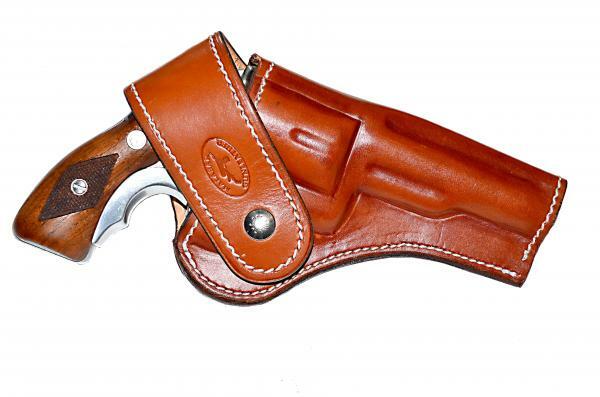 -- a leather tab that protects the rear sight. -- a reinforced belt slot. -- an adjustable tension screw near the frame. 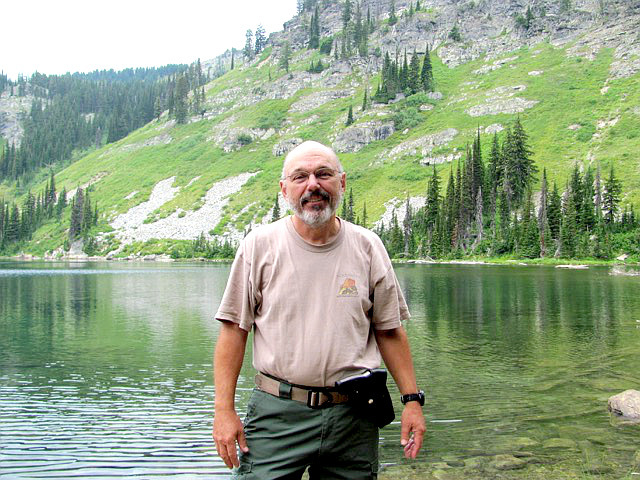 -- a heavy duty flap that locks the gun in place with a military-grade, Pull-The-Dot snap. Rugged enough for a safari, but molded to fit your gun like a glove -- even if your gun is an X-frame S&W .500. Pricing: $115 for most revolvers and autos, in black Hermann Oak cowhide, lined with kipskin; $130 for extra-large revolvers and autos. Horsehide is $15 extra.